What? Another original musical on Broadway besides Something Rotten? O.K. so now that I am over the shock of that news I can move on. After all you came here to get information about Broadway's newest musical right? So why don't I get right to it. 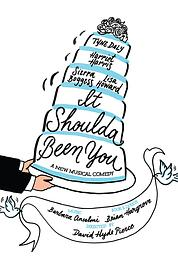 It Shoulda Been You which first premiered in 2011 at the George Street Playhouse will open tonight at the Brooks Atkinson Theatre on Broadway. Directed by Tony Award winner David Hyde Pierce it stars fellow Tony winners Tyne Daly, Harriet Harris and Broadway veterans Sierra Boggess, Lisa Howard, Chip Zien and Edward Hibbert. Now that's what I call a great cast. Of course like several other shows this season I have not seen it. However I have spoken to several friends who have and they loved it. Let's hope the critics do as well. Maybe it will convince other producers out there to take a chance on more new musicals in the future. Intrigued yet? Now since I haven't told you what the show is about yet I'm guessing probably not. Well it takes place at a wedding and that's all I'm going to tell you. Just kidding. The ex-boyfriend of the bride shows up and chaos ensues. So now are you ready to run out and buy a ticket? O.K. so maybe you need a little more convincing. Did I mention that the show is only an hour and forty minutes with no intermission or that you can get tickets to see It Shoulda Been You at prices that can't be beat? In fact when you compare their prices to shows like The Book of Mormon or The Lion King it really is one heck of a bargain. Oh sure It Shoulda Been You doesn't have giant elephants or singing Mormons but it still sounds like a lot of fun. So what are you waiting for people? Get your tickets to see It Shoulda Been You on Broadway at the Brooks Atkinson Theatre. It's just like a real wedding but without all the headache. Until next time theatre fans.